This month, anyone in Finland who buy a lactose-free skimmed milk drink called Eila at the supermarket will buying the world's first carton made entirely out of plant-based plastics—right down to the cap. Tetra Pak, the packaging giant that produced the carton, is very proud of it. The company calls it "the world's first fully renewable carton package," and the key word here is renewable: The raw materials—the source—of the plastic in the carton came from plant-based sources, rather than petroleum-based ones. There are a few different types of plastic at play here, starting with the actual body of the carton, whose three layers are industrially derived from sugarcane, wood fiber, and sugarcane (in order of appearance). Then there's the plastic cap, which is also derived from sugarcane. It's easy to be confused by the various phrases and terms involved with engineering recyclable plastics. But make no mistake—we're still talking about plastics, and the ones used in this carton are variants of polyethylene, the most commonly used type of plastic in the world. Which means that the carton will need to be recycled just like all your other plastics—despite the fact that it came from a natural source. In reality, the name "bioplastics" is more than a little misleading for most consumers, who conflate it with "biodegradable," which it certainly isn't. 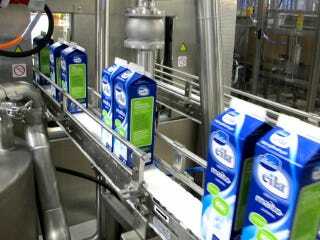 Tetra Pak's new carton was made through a collaboration with the Brazilian petrochemical company Braskem. Brazil is one of the world's biggest makers of the ethanol-based fuel, which is chemically derived from, yep, sugarcane. Over the past few years, it's also branched out into making polymers out of ethanol, as well. Right now, it reportedly produces 200 thousand metric tons of sugarcane-based polyethelene—the same stuff that Tetra Pak's new carton uses—every year. To be able to fully replace plastic from fossil fuels with renewable plastic – which is our long-term aim – will require technology development that makes it possible to use other raw materials beyond just sugar cane. [...] We are carefully monitoring the development of second-and third-generation bio-based plastics. We see possibilities in the future to make bio-based plastic from waste from agriculture, the forest industry, household waste and algae.